1.Universal bike phone Mount / motorcycle phone mount fits most Smartphones(a good choise for iphone holder for bicycle). Quickly and easily mount and unmount your phone or a device. 2. Unic stem cap phone mount with fully adjustable angles portrait and landscape view available, easy for the video record and GPS instruction. 3.Reliable and safety: Durable aluminum alloy with Strong 3M Sticker with 23kg pulling force keeps your phone be holded safety. 4.Easy installation and release in second while parked to prevent theft. 6.Wide application can used on bike, motorcycles, scooter, baby stoller, golf buggies, camping chairs, exercise bikes, treadmills, etc. Applied: All mobile phones with 3 inch or above, fit for cell phones including not limited iphone 6 plus 7 plus galaxy s8, etc. 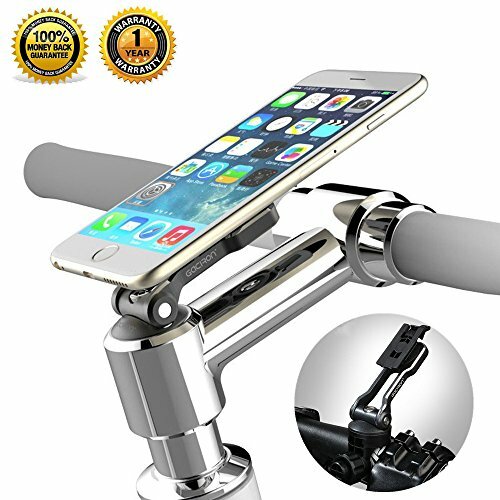 ♛KEEP YOUR PHONE SAFETY:This bike mount holder with heavy duty aluminum alloy metal phone holder with strong 3M back sticker can support 40 pounds pulling force. A good choice iphone holder for bicycle including road bicycle & mountain bike. ♛100 NO-HASSLE 1 YEAR GUARANTEE. We are so confident that you'll love our best seller bike phone mount, that we are offering the greatest guarantee on the market. If you are unsatisfied for ANY reason contact us ✉ for a replacement or a full refund of your entire purchase price! If you have any questions about this product by Gaciron, contact us by completing and submitting the form below. If you are looking for a specif part number, please include it with your message.